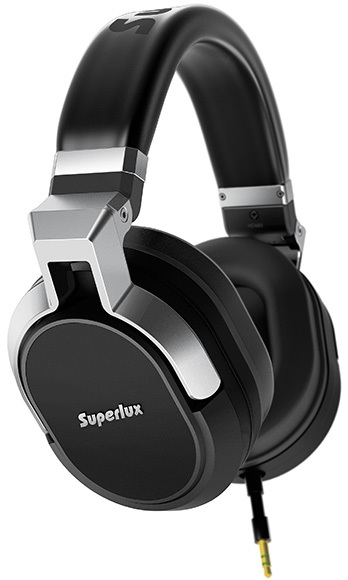 One of the novelties among dynamic monitor headphones is a 40 mm Superlux HD-685 with microphone, 10 Hz – 20 kHz sounds frequencies playback support, neodymium magnets, closed acoustic architecture, dynamic audio emitters and price around 85 USD. Their impedance is 68 Ohms, sensitivity is 102 dB/mW and mass is 285 g without wire accounting ( 310 g with it ); it has 1.2 m length, attached only to 1 cup, can be disconnected and is plugged to sound source via 1/8″ mini jack connector with gold-plated contacts. With headphones 2 cables are supplied, one of them contains volume control module with microphone and mobile devices remote control button. 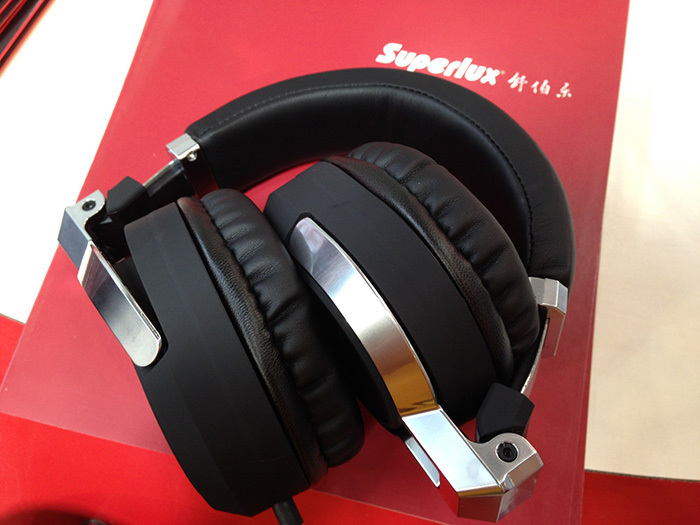 Superlux HD-685 are foldable for compact carrying and storage, earspads are made from leatherette for comfortable sounds and music listening over long time. In each cup there is only 1 sound emitter, they have no active noise-cancellation function, as some other monitor headphones do, but they have good isolation from external sounds. In place of entering into cup wire is additionally reinforced with resin tube for increased wear resistance and durability during bending and tear-off forces application. It is equipped with clip, for tangling and clinging to clothes and surrounding objects prevention, it has no slider for this purpose. Package contains : Superlux HD-685 headphones themselves, 2 cables, carrying and storage pouch, cable clip, warranty card and user’s guide. All in all, headphones are good : with large membranes, wide reproducible sounds frequencies range, neodymium magnets and microphone, their price is not high for their functions. However, there is need to note, that there is ability to buy cheaper 40 mm monitor headphones, or for the same amount of money – 50 mm monitor headphones, providing better basses reproduction quality. There is also ability to say that, if from device compactness and lightness are needed, then there is ability to buy much cheaper in-ears headphones, oriented for use during sportive trainings and exercises and everyday compact use. Their cable is also often equipped with clip and slider.